Selected by Architectural Digest as NC’s Most Beautiful Home For Sale. 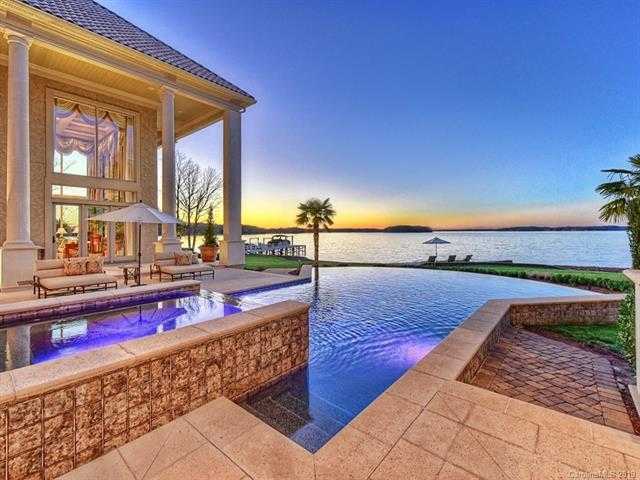 Savor Lake Norman’s most spectacular sunsets from one of LKN’s most phenomenal flagship privately gated estates. Main house + Cabana + outdoor under roof living space total 15K. Exquisitely crafted w/ soaring ceilings, walls of windows, polished travertine floors and Mediterranean accents throughout. Spectacular owners suite w/fireplace, wrap around windows w/panoramic views, remote blinds, massive shower, laundry. Perfectly designed for indoor/outdoor living w/ covered dining,fire pit, private sandy beach & meandering terraces. 2nd level rec room/billiards w/wet bar. Private British West Indies inspired guest house, wood & beam vaulted ceiling w/kitchen,refrigerated kegs, Chicago style alder wood bar w/ leathered marble counters. Sensational Infinity edge heated saltwater pool/spa, 5 car garage. Security cameras, elevator, wine cellar. Located in the beautiful Point neighborhood.